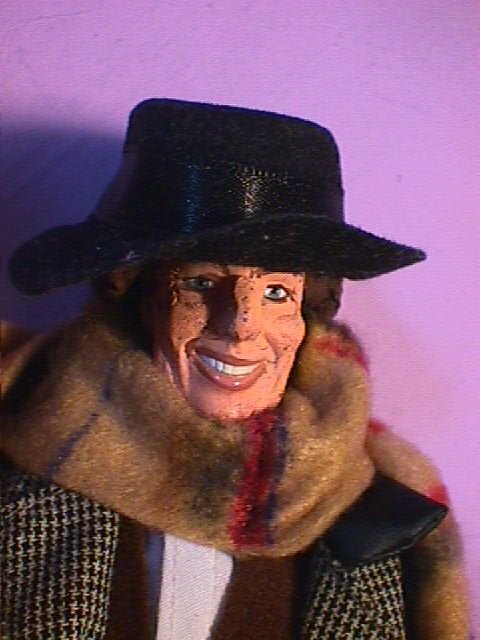 Tom Baker in DOCTOR WHO! The Doctor, hero of the TV Series "Doctor Who" is a traveller through Time and Space. 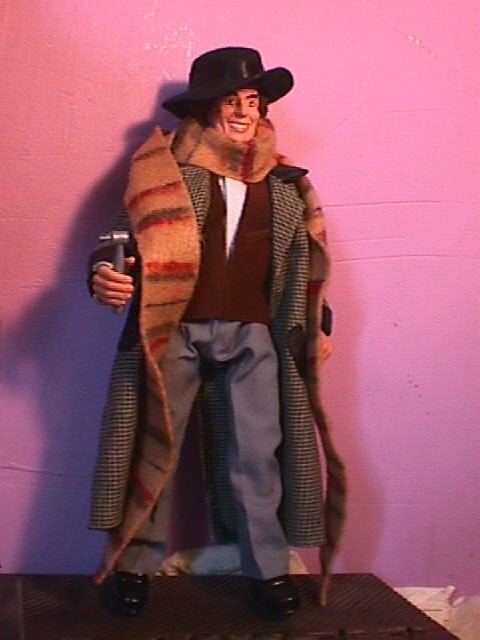 The Doctor is presented here in his fourth incarnation, as played by Tom Baker. Never cruel or cowardly, the Doctor travels through time and space fighting for freedom. "Somewhere there's danger; somehwhere there's injustice... Somewhere else the tea is getting cold," a later version of the Doctor would say. "Come on... We've got work to do!" 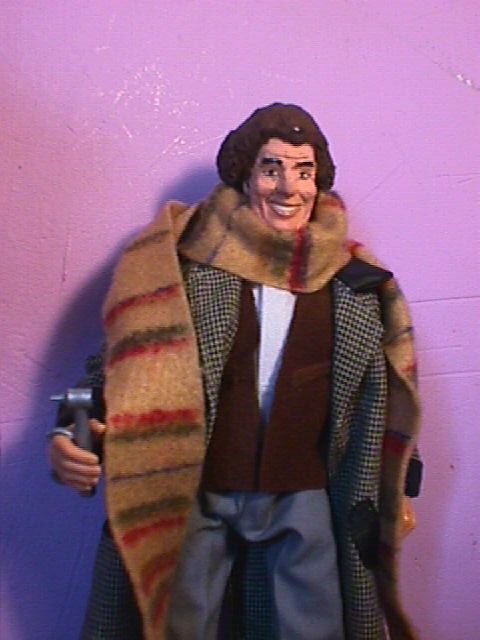 The Doctor is an EP "Greg Brady" with extensive facial modifications and newly sculpted hair, all done in "Sculpey Super-Flex." His hat was from a 12" "Blues Brothers" figure. Grey slacks from a "Space Jam" Michael Jordan Golf outfit, Jacket from a "First Contact" Jean-Luc Picard, White shirt from James West, and brown vest from Greg's original outfit with the fringe cut off. His Sonic Screwdriver is an Otoscope from "Pediatrician Ken." 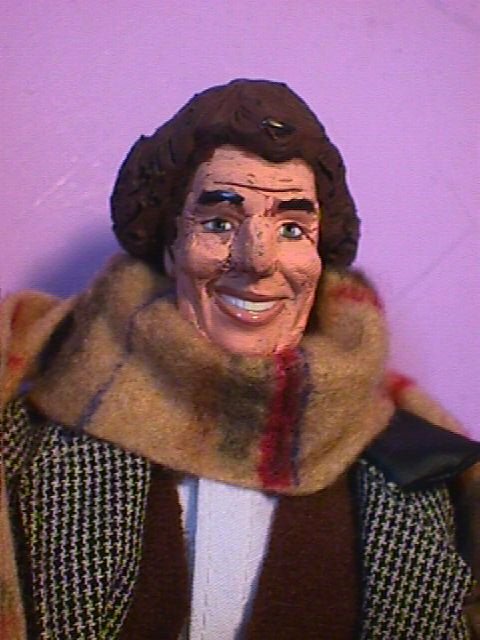 The scarf is made from felt, and colored with magic markers.